TAIWAN and China resumed talks Wednesday at an undisclosed location on a goods free trade agreement, sparking a protest against secrecy by demonstrators suspicious of closer ties with Beijing. Economic affairs minister Woody Duh told reporters before the talks opened in the afternoon that Taiwan would focus on flat panels, petrochemicals, machine tools and automobiles where its industries are competitive. But his ministry has declined to say where the three-day talks are being held, prompting suspicions from the political opposition and activists opposed to the pact. "Why are the talks being held when the Legislative Yuan (parliament) is in recess? 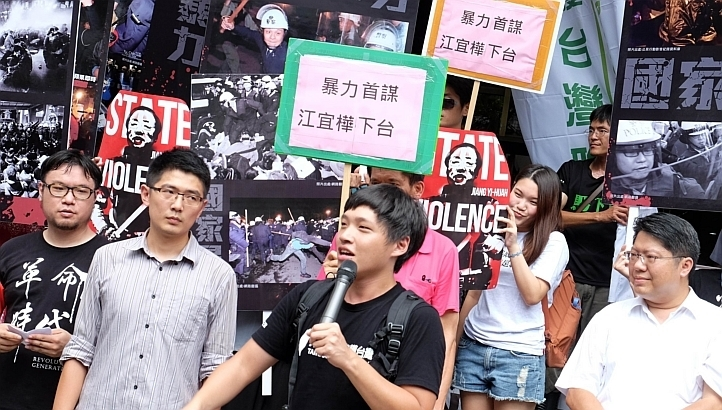 This is a procedure... intended to skip parliamentary supervision," activist Chen Wei-ting told reporters as dozens of slogan-chanting demonstrators rallied at the ministry. "The economics ministry would not even reveal the venue of the talks," Chen added. The talks had been delayed about five months following a series of major protests led by Chen and other student leaders against parliament’s earlier approval of a services trade agreement with the mainland. That pact provoked an unprecedented occupation of Taiwan’s parliament and mass street protests in March and April. President Ma Ying-jeou earlier this week repeated his warning against delays in the two pacts, saying Taiwanese industries could be at a disadvantage against their South Korean counterparts once Seoul and Beijing finalise a free trade agreement. Ties between Taipei and Beijing have improved markedly since 2008 after Ma Ying-jeou of Taiwan’s Beijing-friendly Kuomintang party came to power, dedicated to strengthening trade and tourism links. He was re-elected in 2012. In June 2010 the two sides signed the Economic Cooperation Framework Agreement, which was widely seen as the boldest step yet towards reconciliation following their split in 1949 at the end of a civil war. The goods free trade agreement, like the services trade pact, is a follow-up to the 2010 deal. But many locals are wary of the fast-warming ties, citing China’s refusal to renounce its use of force against Taiwan should it declare formal independence. Opponents have accused the government of trading Taiwan’s interests to Beijing in exchange for marginal economic benefits — allegations denied by the authorities. China’s top official in charge of Taiwan affairs Zhang Zhijun in June paid a landmark four-day visit to the island but it was marred by angry protests which forced him to scrap some engagements.